Capcom has handed the reins for Lost Planet 3 to developer Spark Unlimited (Call of Duty: Finest Hour) for this prequel, which sends the story back to the harsh, unforgiving frozen landscape of E.D.N. III. Players will take control of a blue collar rig operator named Jim, who’s accepted the high-risk job of mining Thermal Energy for Neo-Venus Construction (NEVEC) in order to provide for his hot wife, Grace, and new baby. This being a Lost Planet game, there will be plenty of alien Akrids to kill. And that rig comes armed with a giant drill that can plow through Akrid shells just as well as ice. Here are five reasons we can’t wait for early 2013 to come around so we can play this sequel/prequel on PC, Xbox 360 and PlayStation 3. Lost Planet 3 is the first game in the franchise being developed on Epic Games’ "Unreal Engine 3" technology and it looks amazing. From the cinematics to the actual gameplay, E.D.N III comes to life with amazing detail. And given the track record with Unreal shooters like Gears of War 3 and action adventure games like Batman: Arkham City, E.D.N. III is sure to serve up a beautifully deadly environment to explore. Capcom has created the largest rig yet in this franchise. So large, in fact, that the game will be played from a first-person perspective when piloting the rig for the first time. This gives the game a unique perspective and also makes the battles with the especially large Akrids a challenge. Players will have control of two giant arms, a drill and an assortment of guns and other weapons. As big as the rig is, the enemies are much larger. This game is by no means a first-person shooter. While on foot controlling Jim, the game employs a third-person perspective that shows just how small and insignificant Jim is within this dangerous, lonely world. And it looks like a good portion of the game will force players to get out of the safety of that warm cockpit and into the frigid outdoor landscape of E.D.N. III. 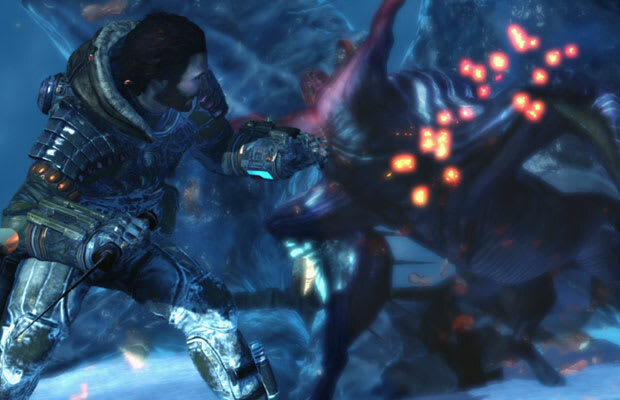 Lost Planet 3 requires players to employ a strategy when when fighting Akrids by using both the rig and Jim’s guns at the same time. The rig’s giant claws can be used as vices to trap an Akrid, exposing its red-tinted underbelly. It’s then up to Jim to jump into the snow and fire at that weak point, again and again, while avoiding the Akrid’s wrath. Even more challenging is the fact that the rig can only hold the monster in check for a short period of time. While Capcom hasn’t detailed exactly what’s in store yet, Lost Planet 3 will support a full set of multi-player modes that promise to enhance the experience. Considering the last game offered both cooperative and multi-player modes, we’re looking forward to both in this new take on the action – complete with these huge, well-equipped rigs.